I was able to shoot with a number of different competitors at the South Carolina Steel Challenge Championships. 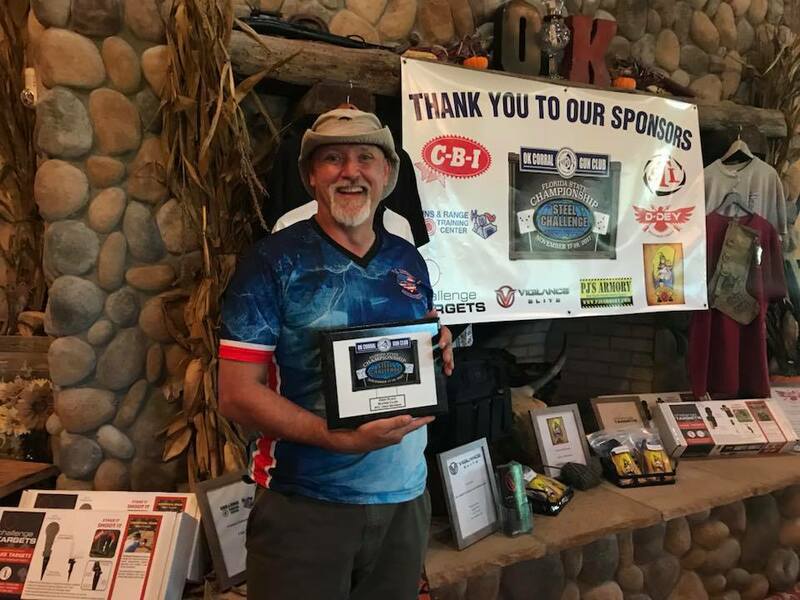 Some were seasoned Steel Challenge shooters, some were Rimfire Challenge shooters and a few were juniors. 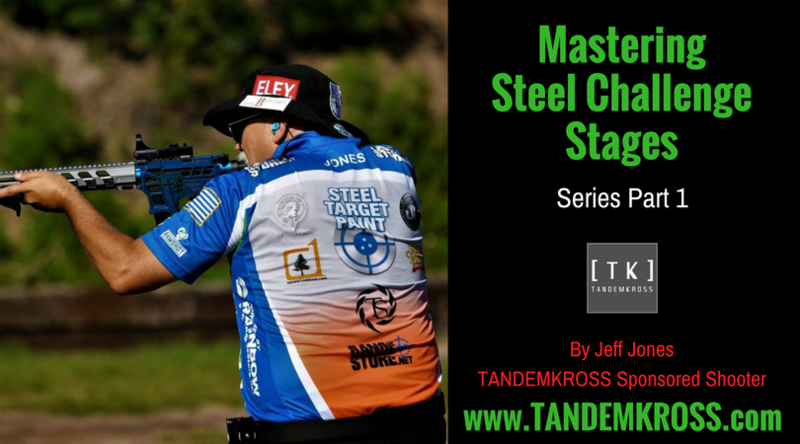 In talking with all of them, I started to share some of my thoughts on my approach to Steel Challenge stages, including positioning in the box and the order in which the targets are shot. Many of the shooters I talked to responded with, “Really? I never thought of that.”. So, I thought I’d start series of blog entries on the subject of mastering Steel Challenge stages. In this series I’ll be sharing my thoughts from shooting the stages myself, watching others shoot the stages and listening to others talk on the subject. I have a good friend that says “If you think you have an original idea, take a cold shower”. I’m sure someone else has thought of these tips and tricks, I’m just bringing my perspective and putting it into this blog post. If you are one of those originators - thank you, you’ve helped me get better. 1. Except for Pendulum, all of the plates can be shot without raising or lowering the gun once it’s in position. If you’ve ever shot with me, you’ll notice I have a routine I go through when given the make ready command. To me, there are 2 make-ready’s. There is the physical action of making the gun ready, loading, racking, putting on the safety and holstering (if required). There is also getting yourself ready. After the Make Ready command, I’ll get the gun up and scan every target. This reminds my brain that all of the targets are at the same height (except Pendulum). Sometimes the targets aren’t set at the correct height, this scan allows me to see that and prepare for that when shooting. This also lets me set the dot brightness to ensure I can see it on every target. Once that is completed I’ll load the gun and get in the ready position. I won’t scan the plates again UNLESS I have a terrible string. 2. There are 24 ways to shoot each stage (except Outer Limits), most don’t work. I number the plates from left to right, 1,2,3,4 and then the stop plate. The number of ways a stage can be shot is a math problem. Since the stop plate is always last, it’s the number of variations that the 4 other plates can be shot. This formula is 4!, which gives us 24 ways to shoot each stage. Outer Limits is different, there are only 4 ways to shoot that stage. You would never shoot Smoke and Hope or 5 To Go in the order 1,4,2,3, S so they are thrown out for those stages. When you get rid of all of the ways NOT to shoot a stage, your left with anywhere from 2 to 8 variations. And before you think 5 to Go has 1 way to shoot it, I’ve seen it shot in the order 4,3,2,1, S for an 8.53 (RFRO) total stage time. 3. One for one will give you your fastest time. A makeup shot is going to cost you somewhere between .2 and .5 seconds. Over multiple strings and stages, makeup shots can cost you a lot. Many times when running shooters in practice, especially after they’ve shot a particularly bad string, I’ll say two things. Take a breath and Go 1 for 1. Most times they end up shooting a fast string. Next time you have that bad string, try it and see if it works for you. 4. There are only 3 plates that I “drive by”: 2 on Smoke and Hope and 1 on Accelerator. To be effective and get your fastest times; you need to learn to stop fast. The fastest shooters in this game get to the plates fast, shoot, and then move to the next plate. Drive-by’s (not stopping on the plates) can give you an amazingly fast time, but you give up consistency. You also increase your chance for a miss, which will then cost you time. 5. I use the phrase “hitch the stop plate,” which means taking the slightest bit of extra time to ensure the hit. 6. After 2 strings, look at your hits, are you high, low, or right where you want to be. Every match is different - the position of the plates, plate height, temperature, wind. All of these things affect your accuracy. If after 2 strings you see you’re hitting high on the plate, make the adjustment. Maybe its grip, foot position or even aim point. This takes less than 10 seconds and could help you put great times into your score. 7. Go to the line with 6 loaded magazines. Magazine break and sometimes strings need to be reshot. What happens if you go to the line with a big magazine and it suddenly fails, how are you going to finish that stage or the match? What happens when you have to reshoot a string because of a range malfunction, or the timer didn’t pick up all of your shots? What happens when you forget to change your big magazine? Having 6 magazines loaded to 10 solves these issues. It also provides a consistent feel on every string. 10 bullets weigh less than 30. 8. I hate the phrase, “Slow is smooth and smooth is fast”…..SLOW IS SLOW! I’ll spend the rest of this post, and the subsequent posts in this series, looking at each Steel Challenge stage more in-depth. Let’s start with SC-101: 5 To Go. I’m sharing the figures below to explore the positioning recommended for this stage. Black shoes are Rimfire Pistol, red are Rimfire Rifle/PCC. You may stand differently, and that’s ok - use this as a guide. Figure 1 is how I used to line up for this stage. Following the advice of some of the great shooters, I’d line up with a natural position on plate 4, twist to the plate 1 and point at low ready. Shooting the stage consisted of unwinding to the stop plate. This worked, but it never felt comfortable. I could get plates 1 and 2 fast, but 3 would occasionally give me problems. I felt that I should be able to shoot plates 1, 2 & 3 faster than I was. 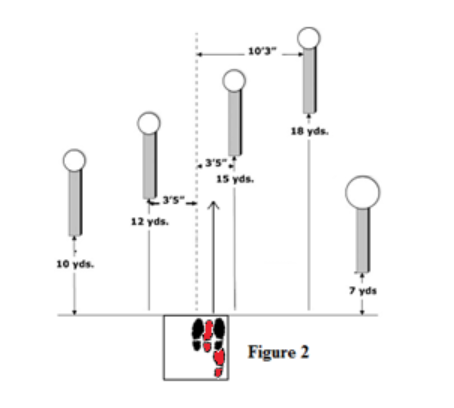 Figure 2 shows the new position of my feet. I’m as far right in the box as I can comfortably go, facing fully forward. Based on the day I may shift so I’m pointing slightly towards plate 4, but it’s no more than a ½ step correction. The third plate (second hardest on the stage) is almost perfectly lined up in front of me. This allows for the first 3 plates to be quick. I hitch plate 4 to ensure I hit it on the first shot and then snap to the stop plate. At the South Carolina State Steel Challenge in May 2018 I was able to drop my RFPI personal best from 13.88 (set in March at the 2018 Nationals) to 12.45. This time was a 10% faster than my previous best. What I am doing on 5 To Go may not work for you, everyone is different. 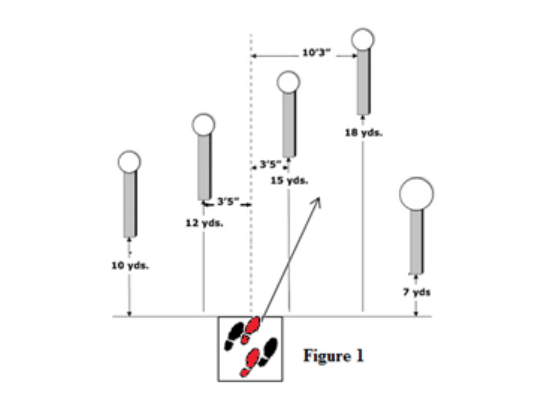 What you should take away from this article is that you may get faster by changing your starting position. Next time I’ll give you my thoughts on SC-102: Showdown. Jeff Jones is a 3-way GM in Steel Challenge and 2017 Florida State Champion in RFPO. He easy to find, look for the black safari hat with the Steel Challenge logo on the back and the TK logo on the front. 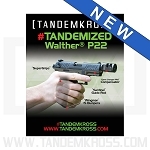 He’s always happy to talk about shooting and TANDEMKROSS. If you see him at a match, stop over, introduce yourself and ask him your questions.